You have probably encountered one of these cute little armored animals before. 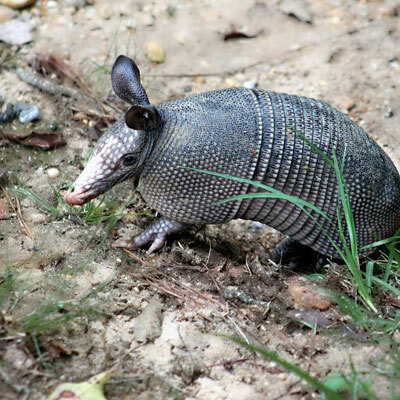 In Spanish, the name armadillo translates to “little armored one”. Armadillos are native to Central America, as they typically seek warmer habitats, however the Nine-Banded Armadillo has migrated its way into the southern states in America. Armadillos prefer hot climates, as they have no real fatty tissue on their bodies to keep warm, and they prefer a looser sand-like soil to dig their burrows in. Armadillos leave tiny holes in their wake as they search through the ground for insects with their snouts. They have poor eyesight so they will walk slowly, following their keen sense of smell. 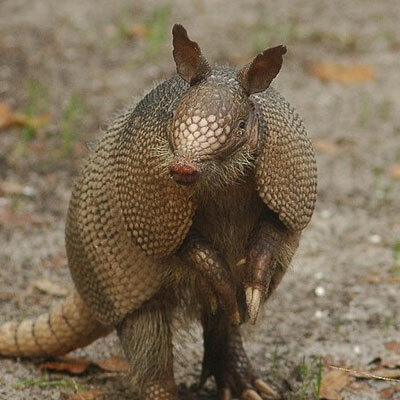 They live in burrows and so in order to dig them, armadillos are also equipped with sharp claws and strong legs. The nine-banded armadillo is the most common type of armadillo found in the United States. 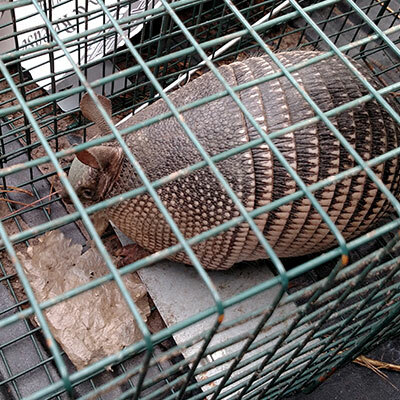 Armadillos commonly show up in residential lawns, and can cause a nuisance. You can often find holes scattered throughout the yard, a couple inches wide and about an inch deep. They may also uproot some of your garden plants if the garden is easily accessible to them. One of the major concerns that they can pose is while they are rooting and digging for food throughout your lawn, they can break pipes or wires located underground. For these reasons, they are often not a very welcome guest in your backyard. It's pretty uncommon to find an armadillo during the day because they feed at night.